Organic String Quartet was nominated as a finalist in California Wedding Day Magazine's 'Best of 2017' awards program and is the recipient of the 'People Love Us On Yelp' award for 2017 as well as WeddingWire's 'Couple's Choice Award' for 2018. OSQ is known for the diversity of music they perform and each of the players is well grounded in multiple styles of music. Members of the quartet have worked with many high-profile artists such as Celine Dion, Stevie Wonder, Frank Ocean, Barbra Streisand, Natalie Cole, and more. In addition, we feel passionately about healing our planet. So each year we donate a portion of our proceeds to American Forests to help plant new trees around the world. Professional, polished, energized, fun. They really elevated our event. Thank you so much, Cole! We had a blast! Best Quartet to use for your Wedding! Alicia and her team were fantastic and very easy to work with. The best part of working with them is that they have nearly all of their songs on their website so that you can sample the songs and see which songs you want to include. They stuck to the songs that we wanted, and they played beautifully! I have been to several events with quartets, and they were one of the best if not the BEST group I have ever heard! They were the BEST that I have ever heard at a wedding. I wish that we spent more time up on the roof enjoying their music, but we were running around doing photos and other things around the venue for the ceremony. They also worked with me on timing so that they had adequate shade if umbrellas or portable cover is not available. We looked at a shade study to confirm that they would have the right amount of shade from an adjacent building structure. Highly Recommend OSQ for Wedding Ceremony or Other Events! Alicia and her team were so easy and wonderful to work with during the wedding planning process! The musicians played beautifully during our wedding ceremony, were very accommodating about learning new songs at a nominal price and I was so impressed with how quickly Alicia always responded to emails and questions. 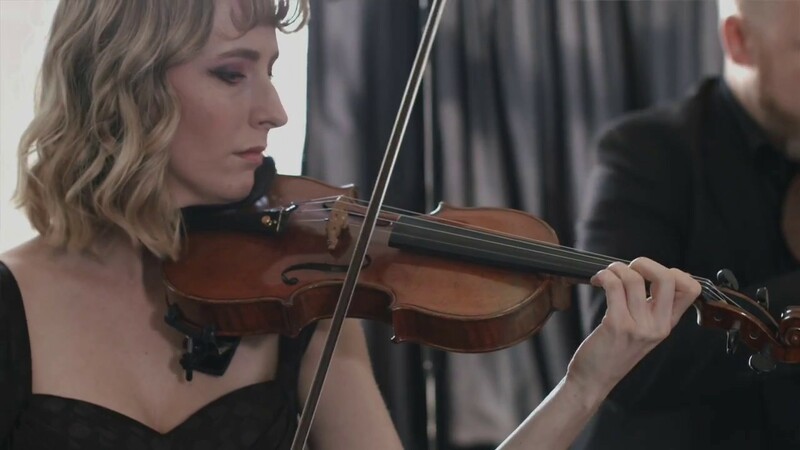 We absolutely loved working with Organic String Quartet and would highly recommend them to anyone looking for live musicians to play at their wedding or other event! I had a duo from the Organic String Quartet play at my wedding for the pre-ceremony, ceremony and cocktail hour. They were absolutely amazing! Alicia is not only wonderful to communicate and coordinate with, but she is also very accommodating to whatever you are envisioning. They learned three new songs that came from our personal congregational song book, and they truly mastered them! They are extremely talented musicians that took my wedding to another level of class and elegance. They helped my fiance and I create our perfect day! Thank you so much, Michelle! We are so glad that you all enjoyed the music! It was a beautiful wedding and everyone was so friendly. Thank you for letting us be a part of your special day! Congratulations!! They were wonderful! Such a great assortment of music! We had them perform for two of our events and they were an absolute hit! Thank you so much, Stephanie! It was a pleasure working with you all!! The guests loved the String Quartet. The guests loved the String Quartet it was just a bummer that they did not start on time. One guy came pretty late. The Organic String Quartet was fantastic! They were punctual, professional, and very talented. We had so many of our wedding guests say how much they loved the music. There is a wide variety of music to choose from and the quartet was very accommodating. I must say, one of my personal favorite highlights was coming out with my groomsmen to the Star Wars theme. They really helped make our wedding truly special and memorable. Thank you, Organic String Quartet! Very beautiful music, polite and lovely musicians and extremely accommodating. Highly recommend! Look no further! Hire Organic NOW! I can't say enough great things about Organic String Quartet! After hearing them play at my company Google holiday party up in LA, I knew I had to have them play at my wedding in Orange County. (Google only hires the best for corporate events so I knew they were vetted, I just needed to make sure they were good to work with and within my budget). Alicia was a *pleasure* to work with - friendly, professional, and responsive. Their pricing was the LOWEST out of the 5 quartets that I received quotes from, which was a huge relief because they happened to be my preference from the beginning. And most importantly, my guests LOVED the music during the ceremony and cocktail hour. Organic's repertoire is very extensive so they were able to fill our cocktail hour with lots of modern top-40 type of music played on the strings (this made the music a huge hit with both the older guests and the younger guests). Look no further - hire Organic for your next event!! Thank you so much Zeena! It was a pleasure working with you as well and we are so thrilled that you and your guests thoroughly enjoyed the music. Congratulations again and we wish you all the best! We hired the string trio for our wedding ceremony. Alicia was prompt with email and polite. We weren't sure exactly what music we wanted, but they took our vague instructions and delivered an outstanding performance. Our guests commented on how lovely it was. They were on time and looked great. If we get married a second time, we will definitely hire them again! Organic String Quartet was a pleasure to work with from beginning to end. Their communication was prompt and clear. The musical performance was a highlight of the event. The performers had a great energy and the guests loved the songs being played. I would definitely recommend Organic String Quartet and would work with them again. Thank you so much, Talita! We had a great time and were thrilled to be a part of such a wonderful cause. It was a pleasure working with you as well and we're so glad that everyone enjoyed the music! Great from initial conversation until the end of the event! Everything was excellent with this booking! Alicia was easy to work with and she was very communicative prior to the event. We needed a setlist containing only 80's hits, and the quartet delivered! Will definitely recommend them as they have such a wide range of music they can cover. 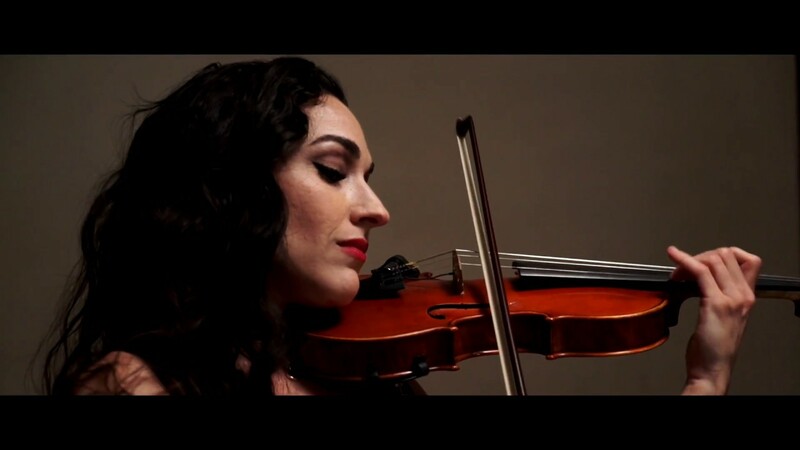 Alicia Spillias, founder of Organic Strings is an absolute professional from the moment she responds to your inquiry to the last music note played at your celebration. The Quartet ensemble she assembled for our wedding was a group of talented young professionals who lent vibrancy and elegance to our ceremony and cocktail hour at Carondelet House. She is a wedding music pro and more - her range is impressive. Responsive, flexible, a pleasure to work with, timely, talented, and extremely organized are just a few words that describe our positive experience working with Alicia. Our appreciation to you Alicia, and to your talented ensemble for bringing your best, and for creating such an inviting and warm and lyrical atmosphere at our Carondelet House wedding! When considering live entertainment for my corporate holiday event, I reached out to several groups, Alicia got back to me right away, and made the booking process very simple. When I had to cancel, she was understanding, and I was thrilled to ultimately be able to work her back into the event. Alicia and Judy arrived at the venue early to set up and were pleasant and accommodating to myself and the venue staff. Prior to the start of the event, we had some time to chat, and it was great learning about some of the exciting places and people the group has played with! It definitely added value when my guests arrived and I was able to share with them what a special opportunity it was to be in the presence of such accomplished professionals. When my event ran long, the ladies were so accommodating and stayed an hour longer than originally planned. They happily accepted requests throughout the event and really elevated the entire experience for everyone in attendance. I could not have been happier with the performance, the ease of booking and working with the group. Will definitely be sharing their contact info with the other event producers within my company, as well as looking for ways to work them into any future events that I plan as well. They showed up on time, were dressed sharply, very professional and played great music. I would definitely recommend them to my friends. We hired them (as a duo with violin & cello) off GigSalad and was a little worried about what to expect. They were amazing, really talented and our guests continued to let us know how great they were. Could not have been happier. When my daughter told me she wanted recorded music for her wedding ceremony, it was the only thing I insisted she change. I was referred to the a Organic String Quartet and could not have been more delighted. The music we asked for ranged from standards, a moving movie piece, to the Beatles. Alicia arranged the pieces they did not already have. Each was played perfectly, well blended, and in the style we requested. Alicia stayed in touch before the ceremony, they arrived early, got all the logistics from the wedding coordinator, and set the tone for the entire ceremony. Live musicians can be a risk. There's nothing worse than a group that is not together, not prepared, or out of tune. But, with the Organic String Quartet, you have a sure thing! So many people took the time to compliment the quality of the music! 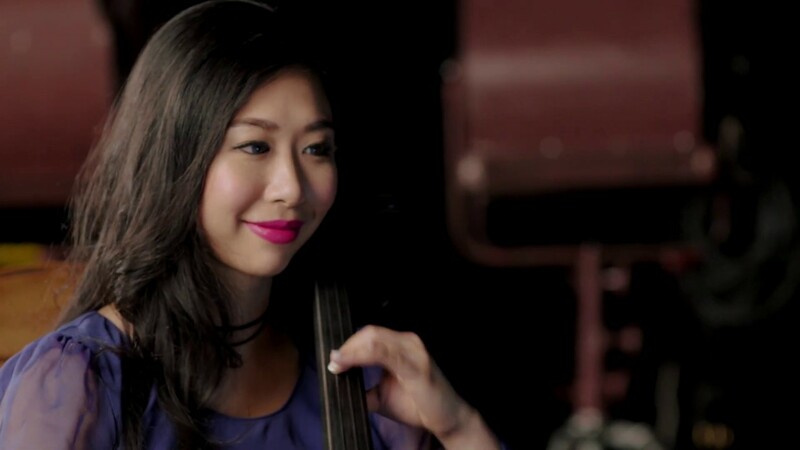 As a musician, I would absolutely recommend the Organic String Quartet to everyone who asks! They exceeded all my expectations, but best of all, the my daughter, the bride and the groom felt that the music played a major part in making their wedding day a dream come true! 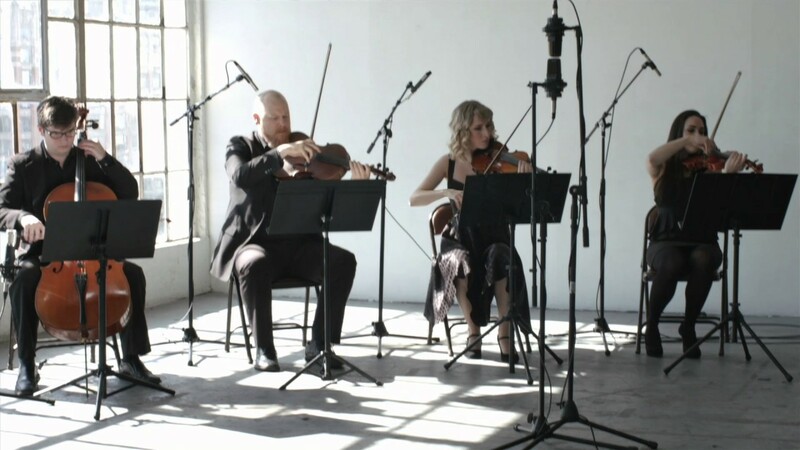 The Organic String Quartet offers a wide array of music from the classics such as Bach and Mozart to contemporary genres of Jazz and Pop/Rock. We can also arrange new music! 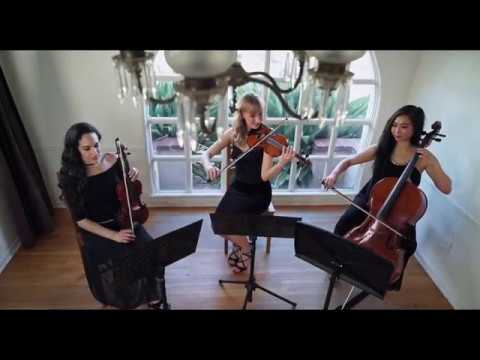 Formed in 2006, the Organic String Quartet is a professional music group that caters to live events in the Southern California area, including Los Angeles, Orange County, Palm Springs, San Diego, and Santa Barbara. OSQ is well known for the diversity of the music they perform (Classical, Jazz, Rock, Pop and World) and each of the players is well grounded in multiple styles of music. Members of the quartet hold degrees from San Francisco Conservatory of Music, Berklee College of Music, Cal State Northridge, UCLA, and Boston Conservatory, and have worked with many high-profile artists such as Stevie Wonder, Macy Gray, Barbara Streisand, Karyn White, Natalie Cole, and more. The quartet was the featured music group on KCAL 9's 2011 special-edition wedding episode and appeared on the season finale of BRAVO's Millionaire Matchmaker that aired in November 2011. As part of their community outreach initiative, OSQ actively works with the Los Angeles Department of Mental Health performing and leading clinics, and in Spring 2011, the quartet had the privilege of performing with Nathaniel Ayers, the man who inspired the movie, "The Soloist". Founded by Alicia Spillias and Emily Moore, the Organic String Quartet is a green business that seeks low-impact and eco-friendly alternatives in every business choice and donates a portion of its yearly proceeds to American Forests to help plant new trees around the world. The only thing that the Organic String Quartet requires for set up is 4 armless chairs and full shade or cover from direct sunlight. Other than that we're pretty easy! We are influenced by all types of music, from Mozart and Beethoven to Henry Mancini to Michael Jackson. We love it all!